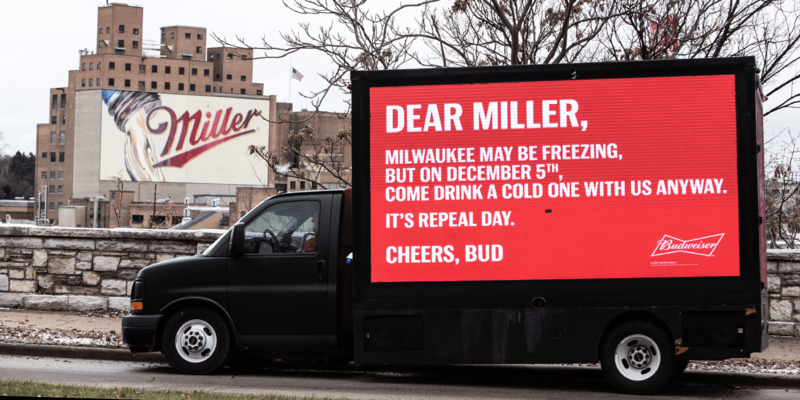 The brand partnered with Jim Beam to launch a new holiday in the U.S.
Budweiser is calling on all beer brands to celebrate the anniversary together from now on. Budweiser concocted a clever plan to not only get consumers involved, but also other beer brands across the country. 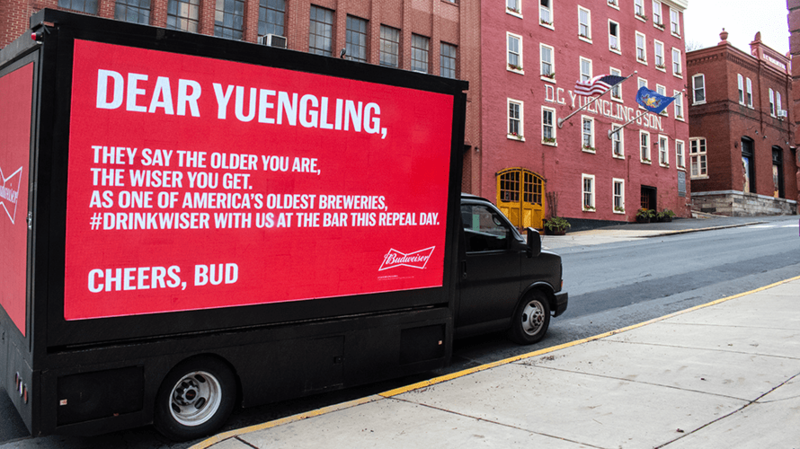 The brand decided to place a number of digital billboards in front of the breweries and offices of some of their competitors, including Sam Adams, Miller, Yuengling and Heineken. The ads aren’t meant to be malicious, and Budweiser isn’t (really) trying to troll any of its competitors with the billboard placement. Rather, it’s calling on all beer brands to celebrate the anniversary together from now on. “For 13 long years, Prohibition kept America’s favorite lager from its loyal drinkers. 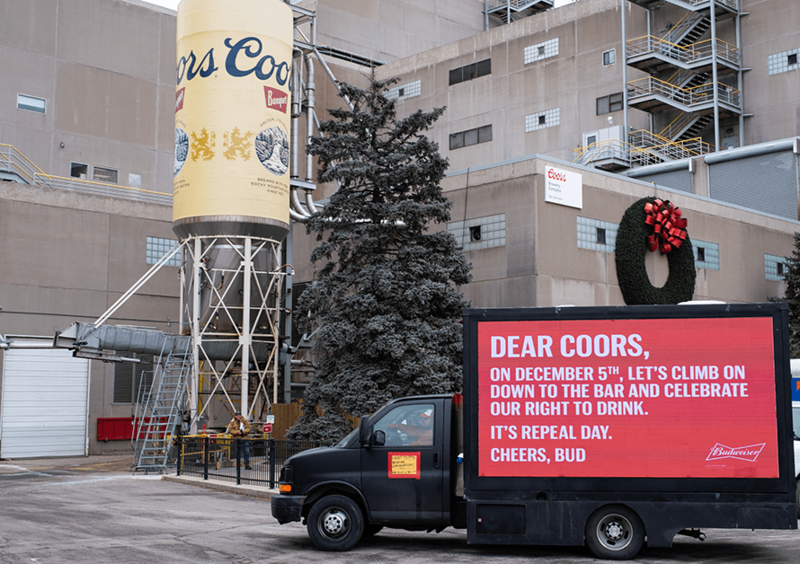 On Dec. 5 every year forward, we’ll gather brewers, friends and beer drinkers at the bar and celebrate our right to drink,” Monica Rustgi, vp of Budweiser, said in an email to Adweek. As longstanding brands in American history, Budweiser and Jim Beam were both around when Prohibition first went into effect and had to stop production of their respective products during that time. Nevertheless, Budweiser got creative during that 13 year period. “Budweiser was able to keep its doors open as we patiently waited for alcohol to come back, and were able to keep all of our employees employed through the creation of non-alcohol products like soap, ice cream and many more,” Rustgi said. 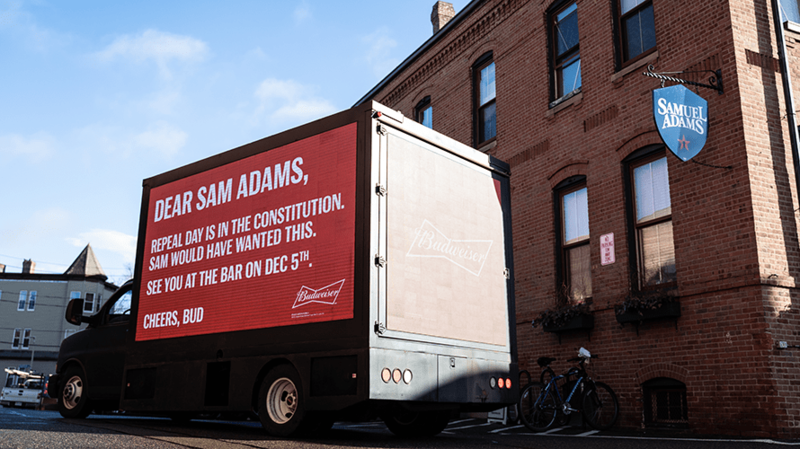 Budweiser and Jim Beam also encouraged other brands and consumers to end their work day at 5:32 p.m.—the exact time the 21st Amendment went into effect—to celebrate the right to drink. 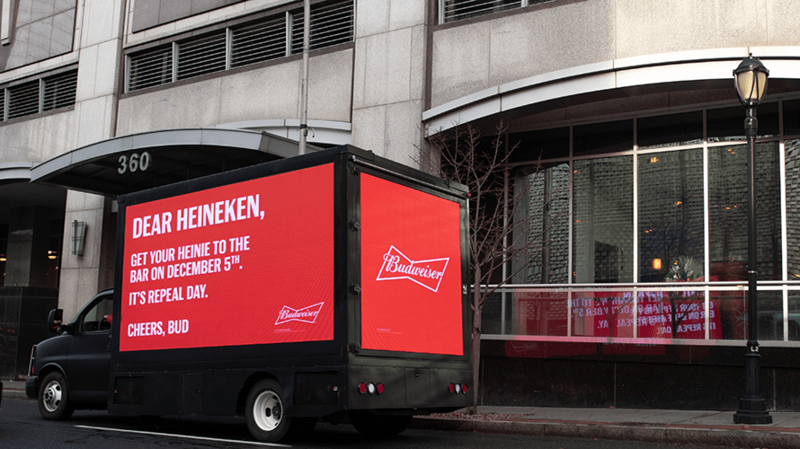 On Wednesday, Budweiser celebrated in full force in New York City, sending the Budweiser Clydesdales throughout the city to distribute beer along the way.